Our annual service of celebration, dedication and thanksgiving. Please book if you plan to stay for the reception following the service. St James Garlickhythe is the Company’s church in Garlick Hill, very close to the Company’s offices. It is a unique 17th century City Church, and has been a sacred place since 1100AD. 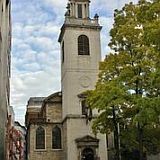 Sir Christopher Wren designed the rebuilt St James in 1683 after the Great Fire to be full of light, since when it has become known as ‘Wren’s Lantern’. The Annual Service will reflect on and celebrate events in the last twelve months. It will be led by our new chaplain, the Rev Helen O'Sullivan, with the support of Father Tim Handley who is the resident priest at St James Garlickhythe. Directly after the service, we will hold our traditional Autumn Reception at the rear of this wonderful church accompanied by drinks and canapes. There will be a charge for those attending the reception so please book if you plan to stay on or if you just come for the reception.